Created with the North American market in mind, the Volkswagen Jetta debuted in 1979 for the 1980 model year. 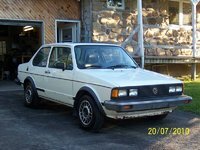 At the time, VW's Golf hatchback (called the Rabbit for the U.S. market) was selling well in Europe, but sales lagged in the U.S., and VW realized many American buyers preferred the sedan body style and more interior space. The automaker remedied the problem by simply adding a back end to the Golf/Rabbit, and the Jetta sedan was born. In the years since, the Jetta has become VW's best-selling car in the U.S. and the best-selling European-made car in the U.S., Canada, and Mexico. Under a different name the Jetta has also sold well in South America as well. Following a naming trend used by VW, in which cars (such as the Scirocco and Passat) are named after types of winds, the Jetta took its name from the Atlantic jet stream. 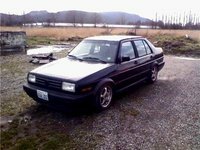 The first Jetta featured an exterior design created by Italian legend Giorgetto Guigiaro and displayed a boxy shape with a square-edged grille and sharply creased lines along the hood and rear deck. The Jetta offered more trunk space than the Golf and an upgraded interior. Since its earliest years, the Jetta has made its mark on the U.S. automotive market and found loyal fans around the world. 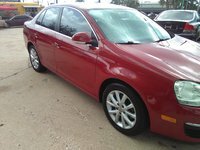 For 2011, VW unveiled a new sixth-generation Jetta, which stretches nearly 3 inches longer than the previous generation, resulting in more rear seat legroom than any other car in its class. Exterior features include a new high-gloss black radiator grille, angular headlights, crisp V-shaped lines along the hood, and a low front spoiler beneath a wide air intake, creating a sporty look up front. Flared wheel arches, clean side lines, aerodynamic side mirrors with integrated turn signals, and split taillights complete the Jetta's exterior look. Inside, new features for the sixth generation include a redesigned steering wheel, more intuitive controls on the dashboard, and an easier-to-read instrument panel, as well as an upgraded optional navigation system. The rear seat splits 60/40 and folds forward to increase cargo space and add versatility. Six airbags, including front-side and side-curtain airbags, come standard. 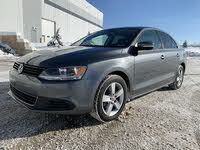 VW offers the 2011 Jetta in sedan and SportWagen body styles, at S, SE, SEL, and TDI trim levels. Base power comes from a rather tepid 115-hp, 2.0-liter four-cylinder engine, which leaves the S trim feeling underpowered at times, according to some early testers. However, a beefier 170-hp, DOHC 2.5-liter five-cylinder powerplant drives the SE and SEL trims. Fuel economy numbers for the four-cylinder engine check in at 24/34 mpg, while the five-cylinder manages similar numbers of 23/33. The TDI trim receives a new 140-hp, 2.0-liter TDI four-cylinder turbodiesel engine, which manages impressive fuel economy numbers of 30/42 mpg. After debuting at the Frankfurt Auto Show in 1979, the Volkswagen Jetta appeared in showrooms for the 1980 model year. Initial body styles included a two-door coupe and a four-sedan in Base and GL trim levels. Power for all trims came from a 74-hp, 1.6-liter four-cylinder engine paired with a five-speed manual transmission. VW also offered an optional diesel powerplant, which put out 50 hp. 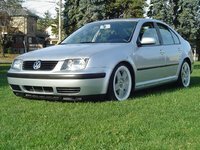 Most of the Jetta's underpinings, including its suspension with MacPherson struts in the front, were borrowed directly from the Golf/Rabbit. The wheelbases of the two cars matched as well, although the Jetta stretched 15 inches longer than the Golf. 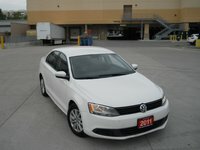 In addition, VW gave the Jetta a more polished interior, with upgraded cloth seats and carpeting throughout. Geared toward buyers in their twenties and families on a budget, the Jetta offered a roomy trunk and seating for four, which made it more practical, though also more expensive, than the Golf. German engineering resulted in a solid, sturdy ride, with smooth handling and good braking, according to early reviewers. The Jetta's powerplants were considered adequate, though not super-powerful. However, the Jetta posted good fuel-economy numbers, which ensured its popularity. 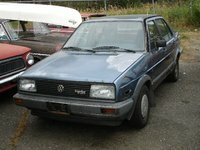 VW introduced the second-generation Jetta in Europe in 1984 and in North America in 1985. The second generation's exterior design was again executed by Giorgetto Giugiaro, who retained the same basic shape but smoothed out some of the Jetta's sharper edges. Other exterior design features included an angled hood, square headlights, and a squared-off rear deck slightly higher than the first generation's, resulting in more trunk space. 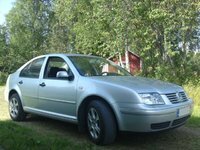 The vehicle was built at a new plant in Wolfsburg, Germany, although VW would soon open additional plants in Bosnia/Herzegovina, South Africa, Nigeria, China, Mexico, and the U.S., making the Jetta a true world car. Due to its combination of price, performance, design, and functionality, the second-generation Jetta became VW's most popular vehicle in the U.S. It sat on a new Golf platform with a wheelbase of 97.2 inches, up from 94.5 inches for the first generation, with an overall length of 171.1 inches, an increase of 3 inches over the previous version. The new Jetta was also wider by just over 3 inches, compared to the first generation. Thanks to its larger size, the second-generation Jetta comfortably seated five passengers and offered 14 percent more interior space than the initial version. Although many of the Jetta's features, including its trim lineup, powerplants, and suspension, rolled over from the previous generation with few changes, the automaker introduced a new Jetta GLI sedan, which received the Golf's 90-hp, 1.8-liter four-cylinder powerplant. The high-performance GLI rode on a sport-oriented suspension, came equipped with a revamped close-ratio five-speed manual shifter, and included a number of unique features, including body-side moldings, a leather-wrapped steering wheel, and an upgraded instrument cluster with three unique gauges. The second generation proved to be the longest in the Jetta's history, lasting until 1992. 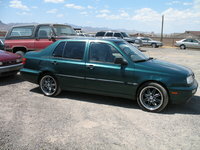 During the 1980s and '90s, VW upgraded the Jetta with a number of new powerplants and features. By 1985, an 85-hp, 1.8-liter four-cylinder engine powered the Base and GL trims, while VW boosted horsepower for the GLI's four-cylinder engine to 100. 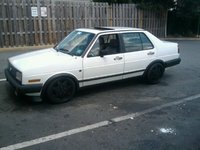 In 1987, the GLI's powerplant again received a boost in power, to 123 hp. In 1989, the engines driving the GL and new luxury-oriented Carat trims again received a bump in horsepower, to 100 hp, while Wolfsburg packages were offered for the GL and GLI trims. The Wolfsburg editions included larger 16-inch BBS wheels (as opposed to standard 14-inch wheels) and interior upgrades such as sport-oriented seats. Following a production delay in the early 1990s, due in part to problems at the automaker's plant in Mexico, the third-generation Jetta debuted in 1993. Overall length stretched to 173.2 inches, while the wheelbase remained the same. Designed by an in-house team, the third-generation Jetta displayed more aerodynamic lines, but again retained the same basic shape and squared-off headlights, although the slanted grille provided a more contemporary look. The two-door body style was dropped, with only a single four-door sedan trim available. The suspension was upgraded as well, and VW used a number of eco-friendly materials for the car's interior features, which proved to be ahead of the times. Power came from a new 2.0-liter, SOHC four-cylinder engine producing 115 hp. In 1994, VW added two new trims to the Jetta lineup. The new GLS, as well as the existing GL trim, came equipped with the base 2.0-liter, 115-hp four-cylinder engine, while the new GLX trim received a 2.8-liter V6 engine, which pumped out 172 hp. The standard feature list grew as well to include power brakes, power steering, power windows and door locks, air conditioning, and cruise control, among other features. The new GLX also included a leather-trimmed steering wheel, a rear spoiler, alloy wheels, and antilock brakes. 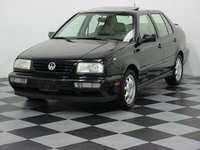 The lineup grew again in 1995, with the addition of the limited-edition, entry-level Jetta City and Jetta Celebration trims. Similarly, in 1997, VW introduced limited-edition Jetta Jazz and Jetta Trek trims. The Jazz was oriented toward music enthusiasts, and included unique upholstery and an upgraded sound system with a CD changer, while the Jetta Trek was aimed at biking enthusiasts and came equipped with a roof-mounted bike rack, foglights, and special cloth seats and instrument gauges. 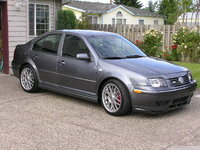 A sport-oriented Jetta GT trim joined the lineup in '97, and in 1998, the limited-edition Jetta K2 trim joined the lineup. Geared toward sports enthusiasts, it came equipped with unique upholstery and gauges, an upgraded stereo system, and either skis or a snowboard. The fourth-generation Jetta debuted in 1998 for the 1999 model year. The wheelbase grew by 1.6 inches, to 98.8 inches, while overall length remained about the same. For the first time since its initial debut, the Jetta dropped its general boxy shape and displayed more fluid, rounded lines. The squarish headlights and slanted grille remained, however. The rear window also took on more of a sloping, fastback style, which helped improve aerodynamics. Trim levels and powerplants remained essentially the same, although VW introduced two new TDI diesel engines. VW added a new engine for the 2000 model year. The turbocharged, 150-hp 1.8T joined the lineup as an option for the GLS trim package, while the 115-hp, 2.0-liter four cylinder remained the base powerplant. Other engine options included a 90-hp, 1.9-liter TDI turbodiesel and a 174-hp, 2.8-liter V6. 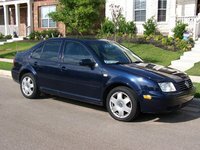 In 2001, VW introduced a new Jetta station wagon body style, available at the GLS and GLX trim levels. The Jetta wagon provided up to 52 cubic feet of cargo space with the rear seats folded, adding to the vehicle's functionality and versatility. Other improvements for 2001 included upgraded cloth upholstery, updated cupholders, optional side-curtain airbags, and an optional sports suspension. Initially powered by the base 115-hp four cylinder, the wagon was available with the turbocharged 1.8T engine in 2002, as well as the optional 174-hp V6. In 2004, horsepower for the optional TDI turbodiesel engine increased from 90 to 100 hp. The fifth-generation Jetta made its initial appearance at the Los Angeles Auto Show in January 2005 and began to appear in showrooms later that year, although trims from both the fourth and fifth generations overlapped for awhile. The new Jetta was first sold in the U.S. before being rolled out to other countries, demonstrating the importance of the vehicle to VW's North American operations. Produced at the automaker's plant in Mexico, the new Jetta sat on a slightly longer wheelbase measuring 101.6 inches, an increase of 2.8 inches over the previous generation. Overall length measured 179.1 inches, an increase of nearly 7 inches over the previous generation. New exterior features included a chrome front grille and somewhat common, rounded lines, causing some to call the new Jetta's design bland and uninspiring. However, the use of high-strength steel for the body resulted in a more solid vehicle with less flexing. VW also redesigned the Jetta's doors and electrical system, and added new optional mechanical and safety features, including electro-mechanical power steering, dual-zone climate control, electronic stability control, and brake assist. The automaker also added a new high-end Jetta 20T trim, powered by a 200-hp, 2.0-liter turbocharged 2.0-liter four-cylinder engine. Base power for the Jetta came in the form of a new 150-hp, 2.5-liter five-cylinder powerplant. An entry-level Value Edition also joined the lineup. For a mid-generation refresh in 2008, VW tweaked the Jetta's lineup, offering the sedan in S, SE, and SEL trims, and boosted horsepower for the mid-range, 2.5-liter, five-cylinder powerplant to 170 hp. The automaker also introduced a new low-emissions PZEV version of the five-cylinder engine for sale in certain states, such as California and New York. 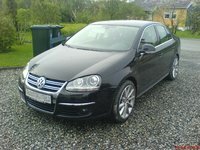 In 2009, the lineup expanded to again include GLI and TDI trims, as well as the SportWagen body style and Wolfsburg Edition premium package. In addition, stability control became a standard feature in 2009. According to J.D. Power, the Jetta's record of reliability and long-term dependability has been somewhat spotty, but that hasn't affected the vehicle's resale value, which remains high, perhaps because Volkswagens are the least expensive German-made cars available to buyers today. In addition, since the Jetta's introduction, VW has consistently positioned it as a slightly upscale vehicle, equipping it with standard features a few years ahead of its competition. 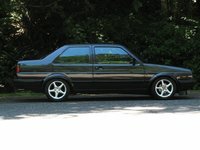 As a result, the Jetta's reputation as an upscale, coveted vehicle remains to this day. Prospective buyers should be aware of a switchover in trim-level nomenclature that took place in 2008. Jetta trims for 2008 and the years following were based on the S, SE, and SEL naming structure, while trims produced for 2007 and earlier were usually labeled using a GL, GLI, and GLS format, although there were variations throughout the years, such as the TDI designation for certain diesel-powered trims. 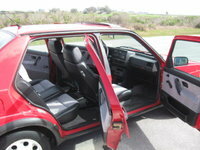 Buyers can choose from sedan and SportWagen body styles, although two-door body styles were available prior to 1993. Used Jettas also come equipped with a wide range of powerplants. Buyers who seek good fuel economy might want to check out the Jetta's diesel-powered trims, such as the TDI, which offer fuel economy numbers of up to 42 mpg, while those who require more power should search out the V6-powered trims. 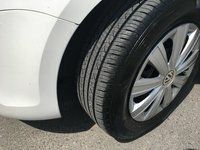 Similarly, those who seek a sportier driving experience should seek out the high-performance GLI trims, which sit on a sport-oriented suspension, while those on a budget might want to look for the Value Edition trims of the fifth generation. 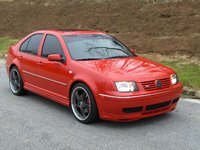 During the 1990s, VW introduced the Jetta in a number of unique, limited-edition trims geared toward specific types of buyers. 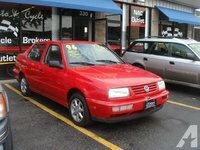 The Jetta City, Celebration, Jazz, Trek, and K2 were all offered between 1995 and 1998, and offered unique designs and equipment. The upscale Wolfsburg Edition of the Jetta, named for the German plant where the vehicle is produced, also offered a unique take on the Jetta for buyers who seek something a little different. For most of its run, the Jetta has earned acclaim for its safety features. For instance, front-side airbags came standard on the fourth-generation Jetta, produced from 1999 to 2004, and side-curtain airbags were added from 2001 on. The NHTSA and IIHS both gave the fourth-generation Jetta high marks for its safety features. Finally, owners should be aware of performance issues with early Jettas, some of which might still be available. Throughout the Jetta's run, reviewers and owners have considered the vehicles powered by the entry-level engines, especially first-generation Jettas, to be relatively underpowered. Buyers will probably find good deals for these vehicles, but should be aware they will probably find performance lacking.